I've paid off my mortgage for now. But I've considered buying a small second home near biking trails or moving to a new home in a neighborhood with grocery stores, restaurants, etc. within walking distance. There's a possibility that I might take out a mortgage for one of these purchases. As I mentioned in my article on personal finance spreadsheets, using online calculators is cool but designing my own spreadsheets is way cooler. I love to be able to create a model to see how a financial concept works. Plus I like to apply this model to my personal situation. This schedule shows how payments are applied to paying down the loan over time. It also models how and when private mortgage insurance is avoided and/or falls off the monthly payments (if the insurance is the type that disappears after the loan balance falls to 80% of the original home value). Note that the mortgage payment is comprised of three parts: 1) principal and interest or P&I; 2) mortgage insurance; and 3) escrow amounts for items like homeowners' insurance and property taxes. The principal and interest (P&I) portion of the payment is fixed throughout the 30-year term of the loan with a fixed-rate mortgage. Figuring the P&I is straightforward, especially when using the payment function (PMT). Adding escrow amounts and mortgage insurance complicates the construction of the mortgage amortization schedule. They increase the monthly payment. But, technically, they don't affect the amortization process. These can be omitted but can useful to get the full picture regarding the monthly mortgage obligation. By understanding upfront what you're required to pay monthly, you can avoid budgeting surprises that could lead to regret and even foreclosure. In addition, by maintaining your own schedule, you can compare your mortgage servicing company's numbers to your own and correct mistakes more easily. Here's the link to the mortgage amortization schedule. Note: Currently, you can download the spreadsheet to Excel or go to File > Copy to make a copy of the spreadsheet with a Google account; I don't allow editing access in order to maintain the integrity of the original file. Do you find looking at amortization schedules useful when making a financial decision? How has this helped? 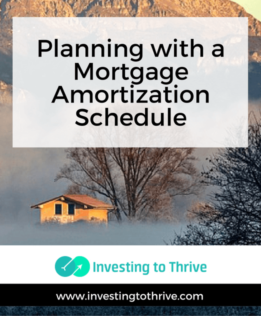 I keep an up-to-date mortgage amortization for our home and rental property and it’s so useful for planning ahead for the future. I also enjoy plugging in extra payments to see what the impact will be on being able to pay off our mortgage early (wow, I’m a nerd!). This is information that everyone really needs!